Have “Favorite Tags” always been alphabetized? Maybe I bumped my head and haven't noticed for the past few years but when did the Favorite Tags start sorting alphabetically? I am almost positive that I used to have php, jquery, and then regex. Please re-enable native custom tag sorting in some capacity or another. 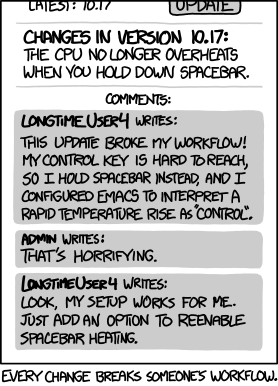 I think XKCD 1172 is most relevant here. Strictly-speaking, they were ordered by the ID of TagSetRow, the table used to store them internally, which would usually match the order in which you added them. Of course, this was predicated on the corresponding TagSetRow being deleted if you removed a tag, which used to be a good bet but isn't anymore. We're currently working on porting the redesigned tag-watching features that we've built for Teams back into the public Q&A sites. This redesign features a number of new features and a streamlined UI (no more hidden "ignore" function, no more having to visit your profile page to change how ignored tags work!). The public version of this UI hasn't changed yet (beyond the sorting), but the plumbing is in place now. And that plumbing is important for what is yet to come: the ability to modify notification settings from the same UI. Again, without having to visit the profile page. Not that any of this helps you... You were relying on a behavior that, while never really intended, was still useful. And now that's gone, and can't really come back without breaking again in a few weeks. Long-term, we're working on an actual feature for this: saved question views, essentially the successor to the now-defunct New Nav project. But, that's long-term; again, it doesn't help you today. So after brooding on this for a while, I threw together a userscript: Reorderable Favorite Tags (now on Stack Apps). This'll restore the previous behavior: tags will remain in the order in which you add them. But it'll even do one better: per rene's suggestion from the comments, it'll also allow you to reorder the tags at will by dragging them around (you have to start editing them first though, so as to avoid inadvertently reordering them while trying to click). The simple answer is no, they have not always been sorted alphabetically and the change appears to have gone through this week (or even today; I can't remember). 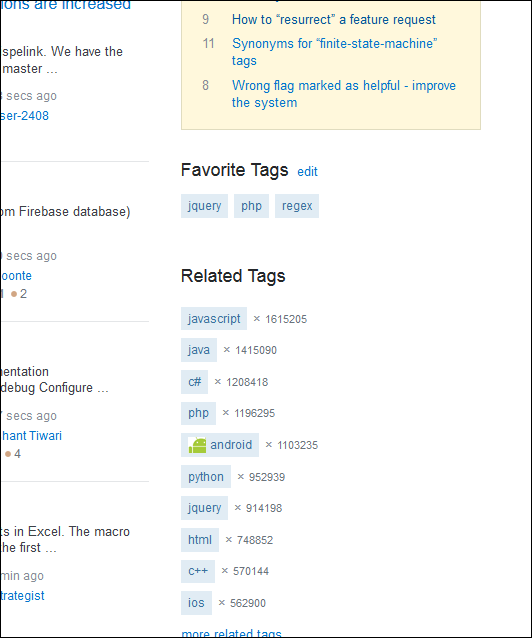 Previously, the tags were in the order that you added them to your favorites. Personally, I would prefer being able to list them how I want to in a custom order, or the previous method of order-added (which is the same as the first ask, just more annoying to do). Not the answer you're looking for? Browse other questions tagged discussion favorite-tags . Why did the ordering of my favorite tags change? Is it harder today to earn reputation on Stack Overflow? Questions from the past compared to now, why is it so different?